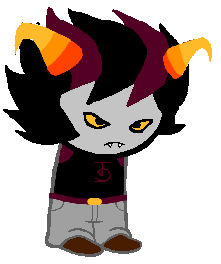 If आप were to make a fantroll, who would आप base yours off of to make it? If आप were to make your own HUMAN प्रशंसक character, who'd be आप pick? WHAT WOULD YOUR GOD-TIER TITTLE WOULD BE AND WHY? If आप could be any kid, troll, exile, या whatever from any comic, anime, या otherwise; who would आप be and why? So I was browsing DA and these two fanspecies came up, Glowans and Trifers. The fanspecies even have fanventure and both are really great. My प्रिय out of two are the Glowan. Why आप may ask? Because I just like how the species look. Aside from looks tho, I thing both are great. These two fanspecies even have infodumps were आप can learn और on how the specie works, which I think is pretty cool. आप guys should check these fanspecies out and give your thoughts on what आप guys think of these fanspecies in the टिप्पणी दे section. Name Origin: Thatos's first name come from the Greek god, Thanatos, minus two letters. His last name is Japanese for "dead". Typing Style: Replaces "t" with "7" to represent a scythe, uses conjunctions and end punctuation. Name Origin: Arcano's names from the work "arcana" meaning either of two divisions, that being a reference of him being able to make spacial rends with a slash. Wyvire comes from Wyvern, a dragon with no arms, two legs, and two wings. Typing Style: be= B, to या too= 2, why= Y, are= R, you= U,see= C, for= 4 replaces words that have "one" in it with the number 1, perfect grammer. Thank आप all फर joining होमस्टक Fancharacters ! I am glad आप have decided to choose a fan-site that allows everyone to express themselves using their ocs. an article जोड़ा गया था: I found two open fanspecies!!! an answer was added to this question: WHAT WOULD YOUR GOD-TIER TITTLE WOULD BE AND WHY? a question जोड़ा गया था: WHAT WOULD YOUR GOD-TIER TITTLE WOULD BE AND WHY? What is Arcano's god tier.